Dinner last Friday was at Orchids, one of the restaurants at the Halekulani, and my companion was the hotel's public relations director, Erika Kauffman. Erika looks like a California blonde, but in fact she was born in Hawaii and grew up on the Big Island (in the Kona area), where she says they didn’t bother to pack lunch for school but simply plucked whatever produce was available from nearby trees. I later learned that Erika is a former Miss Hawaii, but she didn’t discuss it herself. I mean, how could she? “Hi, nice to meet you. I was a Miss Hawaii." You just sound like an idiot if you do that. Her colleague, food & beverage dirctor Sabine Glissmann, could have mentioned it, but why would she? Before dinner, Sabine joined Erika and me for drinks at the House without a Key, which is what they call their mostly-outdoor beachside lounge. A band of ukuleles and a standing bass played surprisingly mellow music as a hula dancer performed and I drank a cocktail of gin and guava and snacked on big-eye tuna poke sliders (with nori, Japanese pickles and wasabi mayonnaise). Erika was big on promoting Orchids’ newest feature, Table 1. It hasn’t been launched yet, but it will basically be a chef’s table in the middle of the restaurant. The hotel’s new executive chef, Vikram Garg, will come out and chat with guests at the table, determine their likes, dislikes and mood and prepare a tasting menu for them. Vik came out after the meal and we chatted about trends (we think pork belly’s about done) and tropical fruit. I mentioned snake fruit, an obscure and completely unappetizing sounding thing that I had in Sumatra. Vik had never heard of it, which we agreed was weird. It’s kind of an uneven oblong about the size of a small plum, with a brown, scaly skin (hence the name). At first bite it’s completely unappetizing. It looks and has the texture of garlic. It tastes a little sweet, but mostly acrid, with a tendency to dry out the mouth, but it’s addictive on some level and actually a lot of fun to eat. When we last left off, it was Friday morning in Honolulu. With marlin, eggs and rice under my belt, along with two half malasadas, I clearly needed to figure out what to do for lunch, and how to get there without irritating my GPS too much. My friend Jonathan Ray, who taught at a fancy Honolulu high school called Punahou ("Pew-na-how,” according to the GPS, who calls Kamehameha Highway “Camay-hamay-ha Highway") had fond memories of Mekong 2 for Thai food, but I thought I’d start with more local fare (not to say Hawaiian, which implies the food of ethnic Hawaiians such as poi and laulau, as opposed to the spam musubi, plate lunches, loco moco and saimin of the locals, whom you can't call “native,” even if they were born in Hawaii, because that implies ethnic Hawaiian, too). So I ended up at Zippy’s, a local diner chain, for saimin, which is a local version of ramen. I scarfed down a small bowl at the counter and then climbed back in the car and drove down S. King St., until I could find parking. By then Mekong 2 was closed for the day, but I went nearby to the corner of S. King and Punahou (excuse me, Pew-na-how) and had an adobo plate lunch. A plate lunch is protein — chicken teriyaki, a burger patty, a piece of salmon, what have you — often served in one of those sectioned-off TV dinner trays, with two scoops of rice and one scoop of macaroni salad. Alan Wong likes to describe that as a quintessential example of how the different groups who have settled in Hawaii have affected each other's food to create something unique in the islands. Hawaii also has a very serious obesity and diabetes problem — among the worst in the country. Some awareness has been raised on that front, and so not only was I able to order a small saimin at Zippy’s, but also I could order a small plate lunch at Pee Wee (so-named because it's a little corner shop, not because the portions are small). So I got a big scoop of adobo — not the Mexican kind, but the Philippine kind, which is stewed pork cooked with vinegar, soy sauce &c. — with one scoop of rice and macaroni salad. I have to say, there’s something about how the mayonnaise from the macaroni salad and the juice from the adobo mixes with the rice that really is magical. With dinner approaching, I figured I should go ahead and stop eating for awhile, so I told the GPS to take me back to the Halekulani, and she did. Just got a call from Monique at La Bonne Soupe, a much-loved neighborhood French restaurant in Midtown Manhattan (48 W. 55th, between fifth and sixth avenues). A fire closed the restaurant some months ago, but the clean-up is just about finished, they’ll be cooking over the weekend and hope to start selling brandade de morou, croques madames and other homestyle French dishes by Tuesday. WHAT: La Bonne Soupe, mid-town’s favorite French bistro re-opens with an aesthetic that captures a new streamlined spirit. The new surroundings are a modern take on the original bistro décor, and regulars, some of who have been coming for over thirty years, will still feel at home in a space with a new-found joie de vivre. Also in place is the ever popular menu of standard bistro favorites like…steak frites, award winning onion soup, fondue au fromage, fondue au chocolat… and daily specials with a more international flare keep every diner in mind. I have the morning off! So it’s time to update the blog. The past two mornings have required that I be out of bed and ready to go quite a bit earlier than I'm accustomed to, but this was really no hardship as Hawaii is six hours behind New York during daylight savings time (the Aloha State does not observe the twice-yearly clock adjustment practice, so it’s five hours behind during the rest of the year). On Friday I was picked up at 6:15 a.m. — a time I’m more likely to see from the other side, before going to bed — by chef George ”Mavro” Mavrothalassitis and his wife and publicist Donna Jung. Donna was the main protagonist in getting me to O‘ahu. I normally see her and Mavro about once a year, when he cooks at the Beard House in early May, and she wanted me to try his food in their restaurant. So she made some calls and here I am. 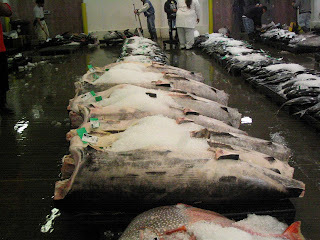 We were meeting so early because they wanted to take me to the Honolulu fish auction, which starts in the very small hours of the day. The first picture in this blog entry is what the auction looks like. 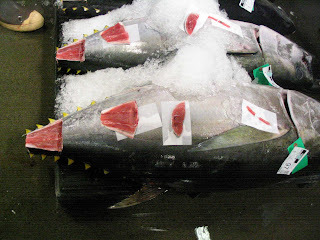 Those are wholesalers bidding on big-eye, or ahi, tuna. They really do have big eyes, but I didn’t have the good sense to take pictures of their eyes. I was more interested in the carcasses, which you can see in the next picture, and the flesh samples taken from each of them for the bidders to examine. One sample's from the tail, one's from the midsection and the third is like a core sample, drilled from the center of the carcass. 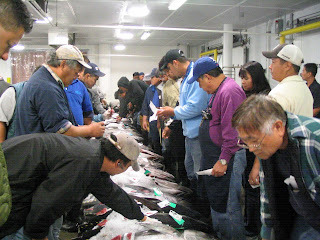 Mavro and I spent most of the time talking with Brooks Takenaka, general manager of the United Fishing Agency, which is what the auction company is called. Donna took a picture of us talking, in case you need proof. Brooks said that in his 30 years working with the United Fishing Agency (he did various fascinating things involving marine biology before that) this year’s catch is the worst. 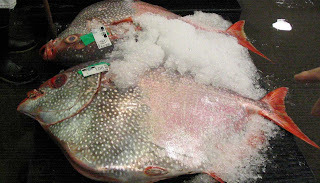 He’s not sure why, as the Hawaiian wild fishery is one of the most strictly regulated on the planet. And there’s no need to panic. One year of bad fishing doesn’t mean ecological breakdown. And on Friday the catch was good. Three boats came in, and apart from ahi, there was also opah, which you can see in the next picture, and swordfish, which you can see in the picture after that. Our conversation with Brooks focused mostly on regulation, and on how the rules that are made tend to be based much more on what sounds good than on what actually helps to protect fisheries. It is very aggravating for Brooks. I told him the story of goose farmer Jim Schiltz, who wanted to sell his geese in Whole Foods, but that self-righteous grocery chain wanted him to raise his geese on all-vegetarian diets. Vegetarian diets became de rigueur for cattle after it was discovered that “mad cow” disease developed when cattle were fed other cattle, including their brains and other parts of their nervous system, which contained prions that catalyzed the formation of prions in the cattle’s brains, which is how they developed bovine spongiform encephalopathy (mad cow disease). Now, that’s all very gross, but what does it have to do with geese, who in fact are not ruminating herbivores like cattle, but waterfowl, for whom it’s natural to eat fish? Jim says if he didn’t give them fishmeal at specific stages in their life, a third of them would die. So we all had a good laugh about that, and then after taking a look at some of the fishing boats, Mavro and Donna took me to Nico’s at Pier 38, a restaurant by the wharf where I had breakfast of Hawaiian coffee (hurray!) and marlin and eggs, with a scoop of rice. Donna had the same thing, while Mavro had loco-moco. 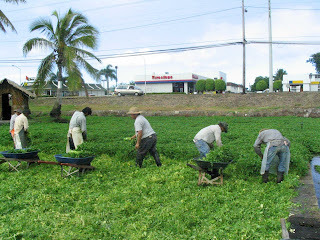 From there we went to Sumida Farm, where about 70 percent of Hawaii’s watercress is grown. The farm is on a wetland fed by natural springs — scratch that, obviously they’re natural. They’re springs. Anyway, a number of hard-to-find birds frequent the farm to eat insects and snails and crayfish and other creatures that live in the water in which the watercress grows (the plant itself roots itself in gravel). My first bird picture is of a black-crowned night heron. I’m not sure why it’s called a night heron, because there it was, sitting around in the middle of the day (okay, it was actually around 8 a.m., but it felt like the middle of the day to me). 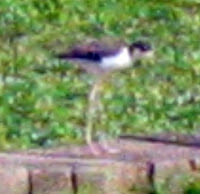 The next picture, the blurry one, is of a Hawaiian stilt. David Sumida explained that a lot of Asian cuisines use watercress as a vegetable, stir-frying the stem, for example. The farm is on a slight grade, so water is always flowing around the cress. Their main weed is a sort of algae, that has to be removed daily, although Filipinos do eat that particular type of algae. David knows that because his workers are almost all (maybe all, but I didn’t ask) ethnic Filipinos, who make up a big chunk of the Hawaiian community. David allows his workers to have garden plots on the outskirts of the farm, and some of them let the algae grow longer and harvest it to eat. 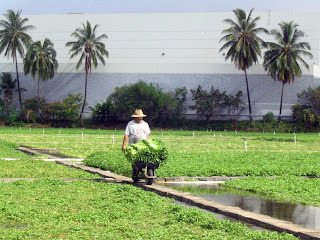 Each plot of watercress is harvested every eight weeks. The plant is pulled up, the roots are chopped off and the rest of the plant is bound into 1-pound bunches, which are then wrapped into 35-pound bundles and vacuum chilled. They are delivered to David’s customers three times a week. Mavro insists that it is the best watercress in the world. He’s French, so you’d think he’d declare anything French to be the best, but of course he left his hometown of Marseilles many years ago (he used to say that only Marseillais knew how to cook fish, then he learned about Japanese cuisine). One of Mavro’s early jobs in the U.S. (maybe his first, but I don’t remember) was in my hometown of Denver, at a fine-dining restaurant called Château Pyrenees, where he worked for a couple of years before being courted by the Halekulani, where he worked at its French restaurant, La Mer, before moving to Maui to work at The Four Seasons. After we left the farm, we went to Leonard’s which is famous for its malasadas, a type of Portuguese doughnut coated in granulated sugar. There was a long line at Leonard’s which pleased us all, because it’s nice to see a restaurant doing good business. Then we drove to Kaimana Beach, to eat them. Donna took a picture of me eating a malasada. That’s a plain one, but I also sampled one filled with haupia. In case you’re wondering, I didn’t finish either one, because, believe it or not, I do believe in practicing restraint from time to time. Donna and Mavro dropped me off at my hotel, at around 10:30 a.m. After I regrouped, I began to explore the city. I am in Hawaii, guest of the O‘ahu Visitors Bureau, which has asked me to come check out the food of the island, home to most Hawaiians. I arrived last night in the Honolulu airport at a little after 5 p.m. and found my way to the rental car companies, where a vehicle was waiting for me. Did I want a GPS? They asked. It occurred to me that, being a terrible navigator, and having never been to O‘ahu before, I probably should go ahead and get one. I soon learned that GPSes make you stupid. Or maybe it was the late hour; 5 p.m. might not sound late, but 5 p.m. in Hawaii during daylight saving's time is 11 p.m. in New York, and I had been on an airplane pretty much straight — except for a brisk walk in Phoenix from my plane that had arrived from Newark an hour late to the aircraft headed for Hawaii that was taking off on time — since around 10 a.m. (4 a.m. Hawaii time). So I was a little punchy anyway. I learned that the GPS gives you some good information (“go .3 miles and turn right on Kalakaua Avenue” although it has no idea which accents to stress with Hawaiian words, making for amusing mispronunciations), but not quite enough information. It doesn’t tell you when the highway is going to suddenly split into three seperate roads, or when you might be trapped in a left-turn-only lane. Normally, of course, when driving you pay attention to those things, because you’re responsible for navigating and you need to focus. With the GPS, I found myself focusing a lot less. “Recalculating,” the navigational system would tell me when I missed a turn, or when I was shunted by my fellow drivers onto a street I hadn't actually wanted to be on. “I was trapped in the wrong lane!” I’d tell it, but of course it didn’t care. After that had happened twice I decided to just relax and enjoy whatever views the GPS and my own ineptitude led me to. 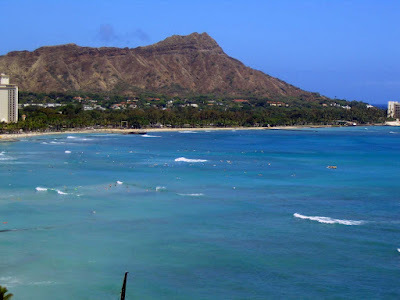 So I toured around the harbor a bit (“recalculating...”) until I managed to inch myself past the alarmingly oblivious tourist pedestrians of Waikiki to the Halekulani hotel. You might have seen the picture of my view from the hotel room in my last blog entry. The picture at the beginning of this entry was, to me, one of the most salient features of the restaurant where I ate dinner, Alan Wong’s. 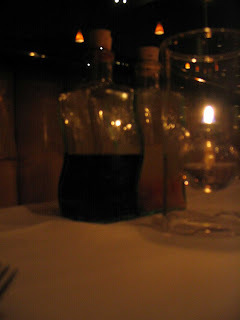 What you see there, illuminated by an oil wick, are two lovely bottles, one containing soy sauce and the other containing vinegar. Those condiments can be seen on many more humble tables in Hawaii and much of Asia. You’d likely see them in dumpling houses in China, for example. Seeing them immediately took me back to the jiaozi, or boiled dumplings, around the corner from my dormatory at Nanjing University, although there the vinegar was dark brown and malty (variations of those condiments are seen in other countries; in Thailand you'd have fish sauce with chiles in it, vinegar with chiles in it, sugar and one of a number of other condiments depending on the restaurant). Alan has a reputation for being playful with his food, and for incorporating local elements into his cooking, but to me it seemed that his food really exemplified the food of Hawaii’s Asian communities (I’m told about 30 percent of Hawaiian residents are ethnic Japanese), brought together in fine dining style without toning down the robust flavors of those cuisines. That’s very different from what happens most of the time when Asian influence is brought to bear on fine dining in New York. There, even in 2009, the Asian influence is usually just a whisper, and the intensity of flavors is almost always toned down to appeal to francophiles and wimps. At Alan Wong’s the Asian influence was front-and-center. But the food, and the restaurant itself, still seemed to me to reflect Hawaiian realities. Wine director Mark Shishido explained that the Portuguese brought the vinegar that they use to the islands. For them, it was a source of vitamin C. The staff also was a great ethnic mix, ranging from my apparently lily-white head server Rachel to the mostly Asian (and mostly young and hip looking) men who brought out and explained my food to me, to the large and maybe a little uncomfortable-looking Pacific Islander (that’s a guess) who seemed never quite sure what I wanted to do with the lemon aïoli that was served with the bread. Probably my favorite part of the meal was the coffee list, an extraordinary menu of about 20 coffees from throughout Hawaii — at least one from every major island. It seemed extraordinary to me, at least. The most advanced coffee list I’d ever seen on the mainland was at Spruce in San Francisco. But Mark said coffee menus were not uncommon in Honolulu. I guess I’ll find out over the next few days. Haupia (that’s a local coconut custard) sorbet with tropical fruits and lilikoi sauce, and dark chocolate “crunch” bars (no®). This is the view from my room at the Halekulani hotel in Honolulu. The picture doesn’t really do it justice, of course, but I thought I’d share anyway. Last Sunday, when 2,000,000 other people in New York were attending or participating in the Puerto Rican Day parade, I was at Seäsonal, stuffing my face and drinking wine — mostly Grüner Veltliner, of which Seäsonal offers six varieties by the glass. Seäsonal is not a good name for this restaurant on 58th St. Sure, they use produce that’s in season (much of the time, I did have quark with strawberries there in the winter), but what restaurant in New York doesn’t? Its main distinguishing characteristic is that it mostly features the cuisine of Austria and southern Germany, under the watchful eye of co-executive chefs Eduard Frauneder and Wolfgang Ban. 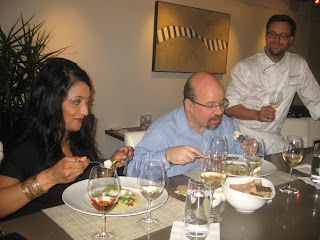 That’s Ed in the picture, looking on with satisfaction as I polish off the vegetables accompanying a fish dish. But she seems a bit more generous of character than that. Sandra had suggested we meet for brunch at Seäsonal (that umlaut is, of course, the only indication of the restaurant’s cuisine), so we met there around 2 and then spent the next eight (8!) hours chatting with Glenn the bartender while Ed and Wolfgang fed us. We had non-traditional things like scallops with beets and horseradish, and really traditional things like Wienerschnitzel, and upgraded versions of traditional dishes, like braised veal cheek goulash. The title of this blog entry is my own fractured version of German, a language I don’t speak. It’s how I hoped you might say Puerto Rican Day in German, but my friend Clark Mitchell, who speaks German, says they’d probably just call the day Puerto Rico Tag. That, however, would not be a good title for a blog entry. Apart from eating, Sandra and I drank a lot of different types of Grüner Veltliner as well as some Blaufränkisch and Pinot Noir and Chardonnay (Sandra’s a Californian and so it’s important that she drink Chardonnay often), and just a little bit of grappa that had recently been dropped off by a liquor merchant. I had meant to do laundry that day for my trip to Hawaii. But we didn’t leave until 10pm, so that was out of the question. Sandra suggested I eat at Alan Wong’s while I was in Honolulu. I had actually interviewed Alan some years ago, when Nation’s Restaurant News inducted him into our Fine Dining Hall of Fame, and it seemed like I should, indeed, try his food. So the next day Sandra e-introduced me to Leigh Ito, Alan’s publicist (Sandra is a very hard-working networker), and dinner was arranged. Darn it! I got a Facebook IM from Morou Ouattara this morning. His restaurant FarrahOlivia, in Alexandria, Va., closed last month. I’ve always liked Morou. He’s probably my second favorite member of the West African Malenke tribe (my favorite is my friend Fatou), and he made an effort to incorporate some West African flavors into the food at his last restaurant. But he's moving back toward the mainstream with an Italian restaurant that he'll be opening in Crystal City. It will be named Kora Restaurant, Bar and Lounge, and is scheduled to open in the first week in July. This was all actually reported weeks ago, except for the opening date, which of course doesn't mean anything until the place actually open, but I just learned about it, and I thought I'd share. It also give me a chance to show you a photo I took of Morou when he was chef at Red Sage in DC, back when I wrote a profile of him in 2000. Sad news: Christian Albin, long-time chef at The Four Seasons restaurant, died on Saturday, just five days after being diagnosed with cancer. His last big event, then, was the restaurant’s 50th birthday party, which I was lucky enough to attend with about 1,000 other people. On average they ate one and a half pigs-in-a-blanket per person, according to co-owner Alex Von Bidder. 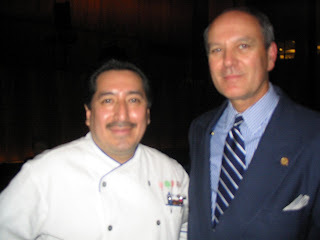 That’s what he told me when introducing me to the restaurant’s chef de cuisine, Fred Mero, pictured here. I’m not a good celebrity spotter, but I’m told that many of them were at the party. Among them were Henry Kissinger (I probably would have recognized him had I seen him) and Salman Rushdie (him too, maybe). Food journalist Peter Elliot almost pointed to Rushdie, but stopped himself as it is rude to point, although I was blocking his finger anyway. We talked about what sort of personality is required to walk up to a celebrity unbidden and just say something. “I walk right up to you,” I said to Peter, who quite un-self-deprecatingly said “but you know me.” Usually when I say sycophantic things like that people wave me off with mock irritation (like when I suggested to Sara Moulton that I could sell her business card on eBay). I think I liked Peter’s response better. I actually ended up spending a fair chunk of time with the Baum family. Legendary restaurateur Joe Baum founded The Four Seasons, you see, and it remains an elegant spot where power brokers like to dine. Above is an underexposed, flash-free picture of the pool room, which looks good no matter how bad my photography is. From the left to right we have Alex Baum-Stein, his sister Annie Baum-Stein, their uncles Edward and Charles Baum (they’re both Joe’s sons), and Annie’s husband, Mauro Daigle. Annie and Mauro actually are going into the foodservice world themselves. They’re opening a food shop, called Milk & Honey, in West Philadelphia (at 45th St. and Baltimore Ave.). 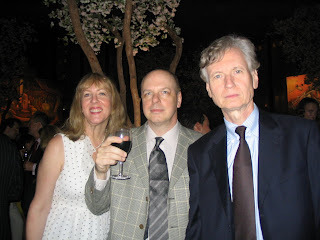 I’ve know Charles Baum for awhile as he’s the husband of New York restaurant publicist Jennifer Baum. He reminisced about when the restaurant opened, when he was nine years old. Here’s another guy hired by Joe Baum many years after The Four Seasons opened. On the left there is Michael Lomonaco, who Baum had hired to be chef at Windows on the World. 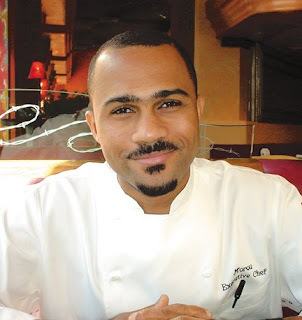 Michael’s the chef-owner of Porter House now, in the Time Warner Center. He said business is good. To his left is self-proclaimed saffron king Behroush Sharifi, who says the price of the spice has skyrocketed recently. Behroush is an Iranian, and he says Iran not only has the world’s best saffron, but he chafes — absolutely chafes! — at the myth that Spain produces most of the world’s saffron. Apparently, it almost all comes from Iran. 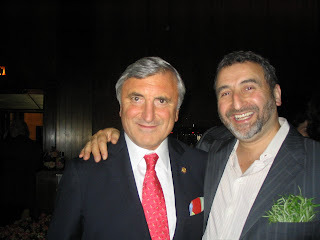 Here we have Alex von Bidder’s business partner, Julian Nicolini, with rosemary bedecked chef Cesare Casella, I guess best known these days for his charcuterie shop Salumeria Rosi. I think he selected a particularly handsome rosemary bunch to wear in his pocket that evening. For awhile I circulated with food writers Julie Besonen and Sheri de Borchgrave, and I explained to them why I didn’t invite any of my friends to be my guest that evening. Because we were allowed to bring a +1. But this was a work affair for me, and I needed to socialize, network, catch up with people. I love my friends, but this was no place for me to catch up with them. Julie agreed, and in fact her husband Jim came an hour after she did so she'd have time to do her necessary schmoozing. Jim’s the guy in the middle of this picture. Julie’s on the left, and on the right is Glenn Collins, a longtime feature writer for The New York Times and, à propos of nothing also the best friend of my cousin Leonard Kamsler, who is the country’s leading golf instruction photogrpaher. I bet you didn’t know the country had a leading golf instruction photographer, but indeed it does, and he’s been friends with Glenn Collins for decades. 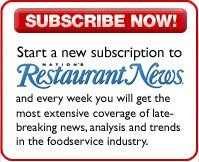 As you may know, Food Writer’s Diary is a product of Nation’s Restaurant News, the great mother ship of restaurant trade magazines, the Death Star (in a good way) of reporting on the restaurant industry. The magazine’s biggest event of the year is MUFSO (MUFF-so), a conference for multi-unit foodservice operators, being held this year on October 4-6 at the Hilton Anatole in Dallas. This year the event is dedicated to Norm Brinker, a mentor to many, many people in the restaurant industry, who passed away last week. Plans are in the works for ways to honor him. •William Taylor, founding editor of Fast Company and one of the shapers of the global conversation about how to compete, innovate, and succeed in modern times. He’ll be speaking as well as moderating our Hot Concepts panel. • Nassim Taleb, author of The Black Swan:The Impact of the Highly Improbable, which is about how unpredictable, one-off events shape our world. He’s a much sought-after speaker on financial topics, having predicted the current crisis. He’ll be speaking and then running a question-and-answer breakout session afterwards. • Frances Frei, Harvard Business School’s resident expert on service management, whose ideas on operational strategies have influenced some of the most competitive companies in the world. Her course on managing services operations is one of the most popular classes at her school, and our publisher, Tom Larrañaga, a man who is not easily impressed, says he was “blown away” by a talk she gave a few weeks ago. “She will send folks home with ideas,” he said in a message he sent to NRN staff. We will also have a panel featuring the winners of our “Golden Chain” awards, which go to multi-unit restaurants that have staged successful turnarounds or otherwise behaved impressively. We have six winners, and I’m going to tell you five of them (because, I mean, come on, we have to keep you guessing a little bit): Burger King, McAlister’s, Bruegger’s Bagels, Cameron Mitchell Restaurants and Burgerville. Our editor-in-chief, Ellen Koteff, will be moderating a Q&A session with Darden Restaurants (Red Lobster, Olive Garden et al.) chief executive Clarence Otis and Domino's chief executive Dave Brandon. So register now. Come on, it’ll be fun! What’s the plural for Batterberry? If it were a type of berry, obviously it would be Batterberries, but Michael and Ariane Batterberry are people. Indeed, they are probably the prince and princess of the New York food writing world. The archduke and archduchess at the very least. They founded Food & Wine magazine many years ago, and then founded Food Arts, where Michael is still editor-in-chief. They are gracious, warm-hearted, charming people who despite their long stint on the dining scene seem still to approach each meal with an open mind and curiosity. I don’t see the Batterberrys all that often, but this week I dined with them, twice. The first dinner was on Tuesday, at Sandro's, the Upper East Side Italian restaurant of Sandro Fioriti. He was celebrating the 25th anniversary of his arrival in New York. 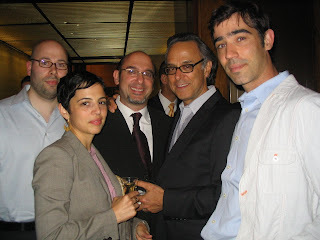 You don't hear much about Sandro these days, but he is very much loved and appreciated by New York’s gastroscenti, for his full-figured jocularity almost as much as for his food. It was before my time, but I’m told that Sandro introduced Roman cuisine to New York when he landed here in 1984 and opened his first restaurant, with the help of Tony May, the father, or maybe the uncle, of Italian fine dining in New York. Since then Sandro has moved around a lot. He is famously as peripatetic as John Tesar, perhaps even more so, donning a toque, imbuing a restaurant with aromatic Roman goodness and then mysteriously doffing his toque and vanishing into the night, or to the Hamptons, or St. Martin. He has stayed at his current restaurant for nearly two years, since he opened it in autumn of 2007. A-List people came to the celebratory dinner, including former New York Magazine critic Gael Greene, former New York Times restaurant critic Mimi Sheraton, and the Batterberrys. Tony May came, too. Incidentally, his new restaurant, SD-26, the Madison Square Park incarnaton of his recently shuttered flagship, San Domenico NY, is scheduled to open on September 9. Sandro's food is still old-school Roman — fried artichokes, a light spring vegetable stew, batter-fried cuttlefish that reminded me of how pedestrian most calamari is by comparison, hunks of roasted veal in ragù. Then the next night, I was at the James Beard house, eating the savory food of Ben Pollinger and the desserts of Jansen Chan of Oceana. Oceana, too, is leaving its current location on E. 54th — the lease expires next month. It’s moving to the McGraw Hill Building (49th St., between Sixth and Seventh avenues, right near Del Frisco's), where it, too, is planning to open in September. The Beard House dinner was intended as a preview of what they were planning on doing at the new restaurant, which will be a bit more laid back than the current Oceana. At Sandro's the Batterberrys and I had talked about Ben and what a fine chap he is, but for some reason I still hadn’t expected to see them at the Beard House last night. In fact, I hadn't expected to see anyone that night that I’d seen the night before, so (this is quite embarrassing), I wore the same necktie two days in a row. What can I say? It’s my Sovereign Beck “bloom” tie, and it’s really very sharp. Back when business attire was required in NRN’s offices, just a few months ago, I never would have worn the same tie two days in a row. I wouldn’t have worn the same tie twice in the same week. But now that our dress code has changed and I don’t wear ties that often, I have become lax. Anyway, if the Batterberrys noticed I was wearing the same tie (different shirt, of course, I mean, come on) they didn’t say anything. They wouldn’t say anything, of course, because they’re not bad-natured jerks. I had a good chat with Jim Poris, another Food Arts editor, who sat to my left (he scooted down when the Batterberries arrived so they could sit down more easily) and talked a bit with Nick Livanos, who owns Oceana (and Molyvos and Abboccato and a number of places in the suburbs) and was seated to my right. I made Nick laugh with my conversation with two Italians at the table, one from Florence and one from Milan. I told the Florentine what I think of Florence, which is that I understand why so many famous sculptors come from there, because Florentines are so beautiful that you want to sculpt them. I told her about one of the most flattering moments in my life: I was in Florence, strolling along the Arno River in clothing I had just bought, and some guy walked up to me and asked me directions, as though I actually looked like a local. 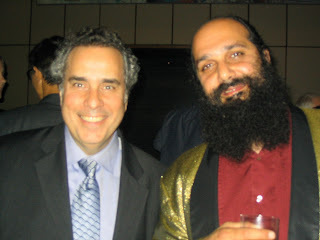 I told the Florentine with whom I was dining at the Beard House that I was Jewish and that I always thought that Jews looked like Italians’ ugly cousins. A plate of doughnuts (which Ariane declared were the best doughnuts ever, ever). Restaurateur Charlie Palmer is in town, and he took the opportunity to provide a preview of his new flagship for local media. As I mentioned when reporting on my most recent "hard hat" preview party (so named because the places are still under construction), at the much ballyhooed DBGB, it’s smart to give media a preview, because it makes us feel closer to the project. The new Aureole is very much in line with what fine dining restaurants are doing in New York these days. I’d show you a picture, but I have no confidence in my ability to do justice to interiors with my inferior photography. The folks at eater.com took nice shots, if you’re curious. Instead I have a couple of artist’s renderings, the first is a view from 42nd St. The second is from Anita's Way, which is the little alley next to Aureole, before Broadway. Anyway, as I was saying, Aureole is doing what a lot of fine dining restaurants are doing these days — diversifying. As Charlie Palmer said (after asking me where my hard hat was) the new Aureole has three dimensions: a bar, a bar-lounge area and a fine dining room. In addition, it has a private room that seats 60 and can hold 100 people for cocktails or whatever. The restaurant, which is starting preview parties with actual food next week (we just got a glass of Champagne, and a bag of milk chocolate-covered toffee from pastry chef Jennifer Yee), has three menus: one of bar snacks, a bar menu that will basically be American brasserie food (this is a fairly new term, but it’s becoming popular; Michael Symon said something similar about the food at his new restaurant, Bar Symon, in the Cleveland suburb of Avon Lake), and a fine dining menu for the dining room, which will be an old-school prix-fixe affair at dinner. The bar and the dining room will have the same menu at lunch, and it will be à la carte, although a prix-fixe option will be available in the dining room. 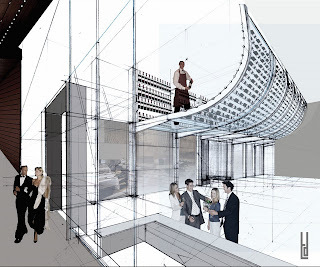 In that second picture you can see that one of the design features is what they’re calling the “wine mezzanine,” which will house 3,500 of the restaurant’s 15,000 bottles — mostly French and Californian — including 100 varieties for less than $100. The art hasn’t been installed yet, but Charlie said they’re computer enhanced images by designer Adam Tihany’s son, Bram Tihany. “This art was developed over many, many bottles of Champagne,” he assured us. The kitchen is freakin’ huge. 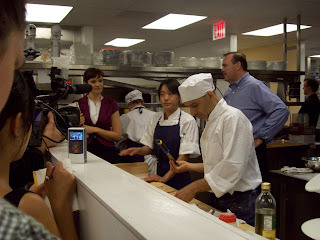 The picture with Jennifer Yee in the middle, a cook kind of in front of her, Charlie on the right and a bunch of media types on the left, is in the pastry kitchen. The savory kitchen is around the corner. All told, it’s three to four times the size of the old Aureole’s kitchen. Today was the first day they had gas, so executive chef Chris Lee and his crew were starting to practice and tweak their dishes. I asked Chris how the food here would be different from his last job, at Gilt, and he said it would be pretty much the same — seasonally driven modern American. They hope to be taking paying customers by the last week of June or first week of July. Some parties are already booked for late July, and a grand opening party and fundraiser for Citymeals on Wheels will be held after Labor Day. Commenting on the restaurant’s three dimensions, Charlie said he wasn’t looking for new customers, but for the same customers to use the restaurant on different occasions. Aureole and its PR machine say the restaurant is in Bryant Park, but it’s quite near the corner of 42nd and Broadway, meaning it’s also in Times Square and will almost definitely have a robust pre-theater crowd. That, as Charlie said, will be a learning experience. Management was nice enough to share with us some very early draft menus that should in no way be considered a reliable source of information on what actually will be served in the restaurant. As for pastry, Jennifer, like Chris, comes from Gilt where she worked at Gilt under executive pastry chef David Carmichael. She now has her own chocolate room and will be making her own ice cream. Bread’s being made in-house, too, according to Chris. June 5 is apparently National Doughnut Day, and if I were really on the ball I would have alerted you sooner that participating Dunkin’ Donuts are handing out free doughnuts with the purchase of a drink. Please note that I wrote “participating” stores. Dunkin’ Donuts is all franchised and it’s up to each franchisee whether to participate or not. In other Dunkin’ news, the company just announced that Jeff Hager of Hoover, Ala., is the winner of its “Create Dunkin’s Next Donut” contest. His “Toffee for your Coffee” is a glazed sour cream cake doughnut topped with chopped Heath Bar. Hager gets $12,000, and his creation will be available at Dunkin’ Donuts (participating ones, I imagine) this fall. I asked Dunkin’ Donuts if they made up National Doughnut Day, but they said they didn’t. I wonder if it was Winchell’s. New Yorkers might remember Ed Witt as the creative chef at two short-lived restaurants, Varietal and Bloomingdale Road. Well, he’s going to try his hand at cooking in a different city: He has moved to Washington, D.C., and he plans to open a place in Georgetown at the end of the summer called Morso. He says it will be small plate Mediterranean cuisine with a Turkish influence, and as an indication that he’s not kidding around, he’s about to leave for Turkey for three weeks of research. This is particularly interesting to me because I’ve seen an uptick recently in cuisine of the Eastern Mediterranean. I think I’ll write a story about it. Mind you, I’m 42 years old, and thus not a kid. I’m certainly younger than Mike, though, who took on a de facto mantle of leadership during our recent trip to Puglia with the Gruppo Ristoratori Italiani. Tommaso's chef and owner, Tom Verdillo, was on the trip, too, and he’d had us over for dinner while trying to replicate some of the dishes we’d eaten on the trip. Alan Schoenberg, whose family has been salt merchants in Brooklyn for three generations, was on the trip, too, and he has a car, so I rode with him and his wife Brenda. Also at dinner was food-writing couple Bob Lape, until very recently of Crain’s New York Business, and his wife Joanna Pruess, who has written many food books, most recently a bacon cookbook. She’s currently working on one on cast-iron pot cooking. Bob and Joanna weren’t in Italy with us, but they were invited to dinner anyway. Mike Pesce was an enthusiastic senior aficionado on the trip. He’s a Barese, you see, a native of Bari, which is Puglia’s capital*. Tom, being a chef, strayed a bit from his original plan, and served other dishes as well, including a sort of salt-cod pâté (not unlike a French brandade de morou, except that dish is made with potatoes, and Tom’s was all fish), and his own signature dish for the season, Nantucket Bay scallops, steamed with plenty of garlic. Tom never fries garlic. The key, he says, is to cook it gently to tone down it’s bitter qualities. Here’s another thing about Tom and his cooking: His family is from near Naples, in Campania — if Puglia is the heel and back ankle of the Italian boot, Campania is the lower shin — but he doesn’t like dried oregano, a key herb for the region’s food. “I prefer marjoram,” he says. And he also uses fresh oregano, from his own garden. He served a traditional regional dish called fave e cicorie, which you'd think would mean fava beans and chicory, but in fact, it means basically any beans and any bitter green. Normally the beans are puréed, but Tom tracked down some beautiful gigante beans, which as you can imagine are gigantic (for a bean — let's say an inch and three quarters by two-thirds of an inch, or something like that) so it would have been silly to purée them. And he cooked them with dandelion greens. Then he veered away from Puglia with a Calabrese dish (Calabria is the front of the foot of the Italian boot — the part that’s kicking Sicily), because he’d procured some cod tripe from Chinese suppliers, and the Calabrese stuff that and braise it. It was very tender, and had the sort of unctuous quality that good tripe has. I think Mike enjoyed it, but he also said that Calabrians and Sicilians aren’t really Italians, but something different, which is really what you’d expect a Barese to say. Then we had orecchiette made with Primitivo wine (Primitivo is a grape native to southern Italy, and is in fact the same grape as Zinfandel) and a ragù of all sorts of meats, including lamb and rabbit and pork, and some veal sausages. I ate too much of it, especially since it was followed by a black bass that had been caught the evening before. The people who caught it couldn't fit it into their fridge, because it was so big, so Mike had them call Tom and drop it off. At that point we opened the bottle of wine that Alan had brought, a 1949 — yes, 1949 — Burgundy, a Volnay, that remained fully intact, robust and delicious. You never know with wine that old. And that was followed by a semifreddo topped with chocolate. So then, full of food and wine, we slowly stood up, wandered outside into the great late-spring air and chatted a bit more, and that’s when Michael Pesce slapped me in the face before wandering off into the night with his girlfriend. 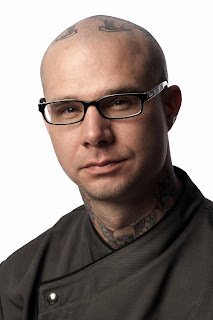 Mike moved to the U.S. as a teenager and did the typical American dream stuff, working his way through the ranks to become one of New York State’s top judges as well as a food and wine aficionado and by all accounts a respected member of the community, nice guy and all-around good person. I couldn't decide whether it was more generational or Italian to slap someone in the face affectionately. It’s definitely an alpha male thing to do, and a product of a patron-client system: I don’t think you could slap someone who was both your social equal and of a similar age. I imagined slapping my underlings. I don’t have any actual underlings, really, but I am the official mentor of my colleague Mike Dempsey, who likes to do food writing, and I encourage him, try to get him good assignments and give him advice when he asks for it. I think he might let me slap him, once, gently, the way Mike Pesce did, but I don’t know if I can reach that high: Mike Dempsey’s 6'5", making him 13-and-a-half inches taller than I am. So I’ll probably never really know. *Technically, Mike’s not from the city of Bari, but from the province of Bari, but provinces in Italy are really like U.S. counties. They’re small, and you can be counted as a Barese if you come from anywhere in the province.